Whey protein (the highest quality and best form of protein) provides the body with the necessary building blocks to produce amino acids that are used for building muscle tissue. Whey protein has the highest BV (biological value) of all natural protein sources. This allows your muscles to absorb more protein and grow faster. * Whey protein also plays a role as an antioxidant and helps support a healthy immune system. * Pure Whey is packed with Whey Protein Isolates. They are the purest and most expensive form of whey protein that exists. Even more Pure Whey contains Whey Protein Hydrolysates (whey peptides). Hydrolyzing breaks larger proteins down into smaller pieces that are able to get into your body rapidly, enabling your muscles to start rebuilding quickly. Pure Whey is also loaded with Glutamine and BCAAs, which play a significant role in stimulating muscle growth while also protecting valuable muscle tissue and enhancing muscle recovery. 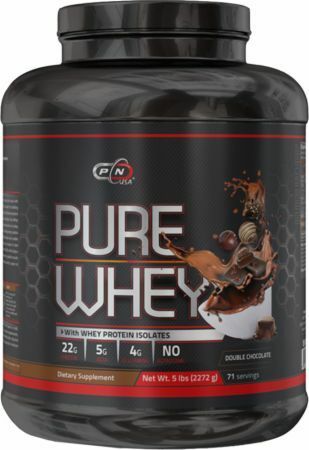 * Pure Whey mixes instantly with a spoon or shaker and tastes great. Pure Nutrition was found in 2011. At that time we already had experience selling other brands of nutritional supplements. Spending more than 5 years looking for the “perfect” products, In the end we have found out that there is only one way we can be sure we have the best quality products, the best tasting proteins and products that deliver uncompromised results - create our own supplement line. With so many good brands on the market, the beginning was very difficult. We started with less than 10 products, but currently our portfolio includes more than 230 different products. Since then we have committed to becoming one of the most trusted brands in the industry. Our mission is clear our customers are our number one priority and therefore, we strive to provide them with nothing else, but premium-quality products at affordable prices. Several years later, looking back - we are satisfied with how the product line looks. The joy of customer satisfaction motivates us to continue doing what we do even better.